A trattoria that earnestly pays homage to Southern Italy. : With so many new-school pizza joints in Philadelphia, it can sometimes feel hard to choose, but the pies at Brigantessa, Passyunk’s paean to Southern Italian cookery, should not be overlooked. Antipasti includes fermented baby eels spiked with Calabrian chili, roasted cauliflower with a zesty ’nduja mayo and a delicate shaved fennel salad with citrus vinaigrette. 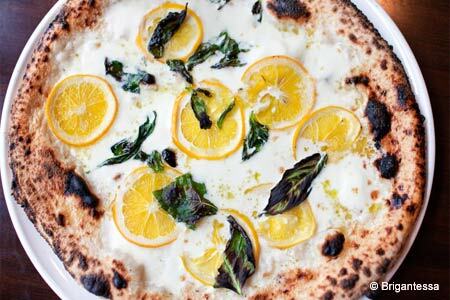 The wood-fired oven produces on-point margherita and marinara pizzas as well as an incandescent Sorrentina with paper thin Meyer lemon slices alternating with buffalo mozzarella. Pastas like the squid ink brigadiere “hats” stuffed with baccala and tossed with crushed peppers and toasted bread crumbs brim with bold flavor. Meanwhile, a wood-fired grill turns out a dry-aged strip loin over local corn polenta with green garlic. For dessert, try the Nutella-ricotta filled zeppoli or an affogato with homemade fior de latte gelato. The exclusively Italian wine list includes five selections on tap, and flights of Amari are available for the bitter-curious. The weekday happy hour offers $2 off the 16 draft beer selections, $10 pizzas and $6 draft wine.